As many of you know I have turned almost exclusively to Micro 4/3 cameras and lenses for both my professional portraiture and also from my personal photography. But I don’t just create portraits of people, I have a separate website just for animal portraiture and wildlife imagery. 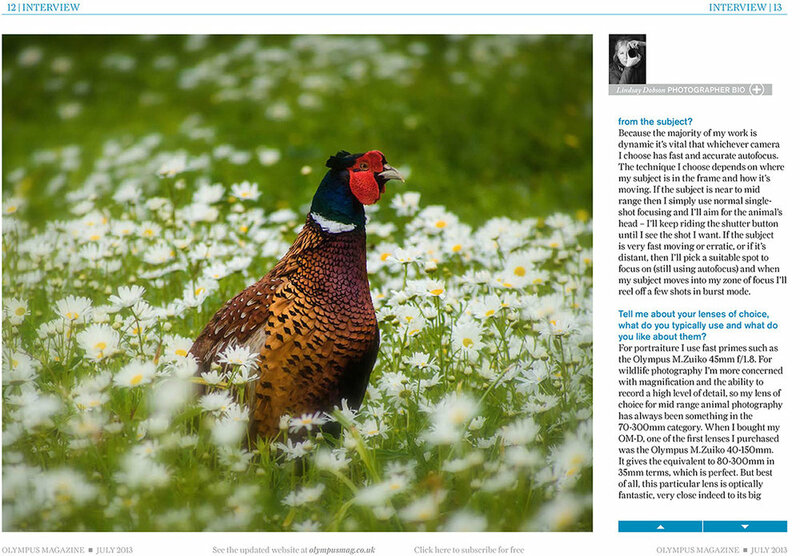 I had a lot of fun talking to Olympus UK about how I use the OMD cameras to photograph nature, pets and wildlife. Pet photography is a big part of my business as a portrait photographer. Wildlife photography is something I enjoy in my personal time, and I also have a number of students who want to learn more about this subject. I think the Olympus OMD system is very well suited to this kind of work, most notably because the autofocus is very fast and accurate, the frame rate is high, and of course the image quality is very good. And let’s not forget the excellent lenses. Importantly for me at least, I can carry an entire complement of kit in one small bag without feeling weighed down. This can make an enormous difference to your energy levels throughout the day and the state you’re in when you arrive home. 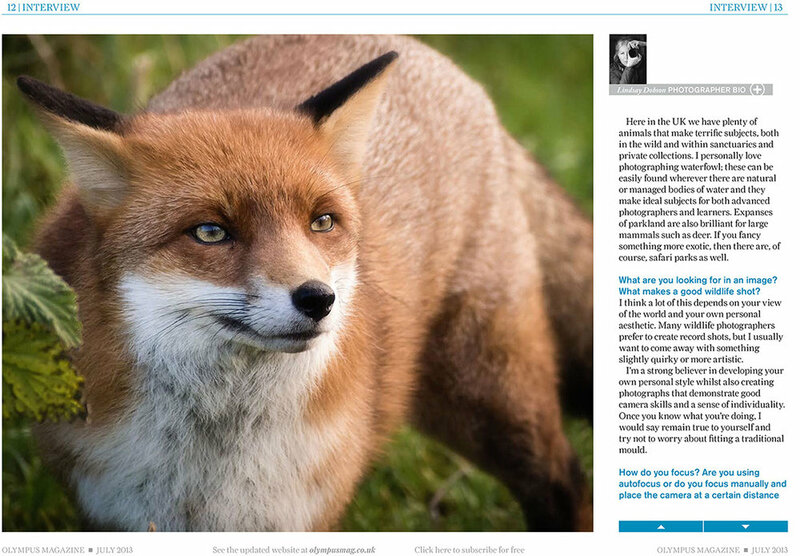 The interview resulted in a large feature about the animal photography I undertake and how I go about it. This can be seen in the July 2013 edition of the magazine and covers some nine pages. Becoming known for something can have its downsides. Having received another accusatory e-mail from a reader there appears to be a misguided assumption that in order to be featured in this magazine I must be sponsored by Olympus or Panasonic. This is a little confusing, but for the record I buy my equipment at my local camera store just like everybody else – I am not given it, nor do I receive discounts or privileges from Olympus (but to be frank, it’s about time I did, for services rendered as a bona fide and prominent user of their system). The information I freely share on my Blogs (on my own considerable time and overhead) is and will remain my personal unbiased view based on my own direct experience. I was approached by the publishers of the Olympus Magazine and asked if I would talk about my nature and wildlife photography, and how I use the OMD in the field. One of the reasons I was asked is because I came very close to giving up my photography career entirely due to severe RSI and arthritis, and the small size and light weight of Micro 4/3 equipment has enabled me to carry on, which made for an interesting storyline. Incidentally I still have a bag full of top-of-the-line Canon DSLRs and L lenses, and I’m not sponsored by Canon either. Where is the rolling eyes smiley when you need it …… and lastly I will say that the more prominent you become the more detractors you’ll acquire, which makes me doubly thankful for the many readers who have become my friends over the years.